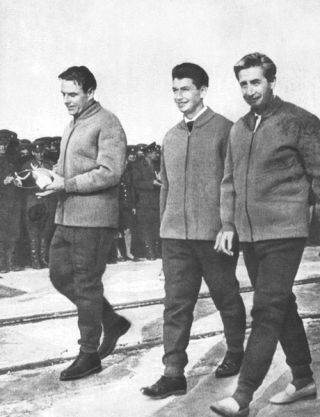 Konstantin Feoktistov, right, with his Voskhod 1 crew mates Vladimir Komarov, and Boris Yegorov make their way to the launch pad on Oct. 12, 1964, sans spacesuits. A member ofthe first three-person space crew whose flight was onboard a vehicle hehelped design, cosmonaut Konstantin Feoktistov passed away at age 83on Saturday, according to a statement by the Russian spaceagency Roscosmos. Feoktistov made hisfirst and only space flight on Oct. 12, 1964 aboard the USSR'sVoskhod 1 on a one-day mission to test the craft'sdesign, perform biomedical research and to study how amulti-disciplinary team could work together in space. Marking the first time that morethan one person, let alone three, were launched to orbit together,Voskhod 1's trio of crew members included Feoktistov, the firstscientist to fly; Boris Yegorov, the first medical doctor in space; andVladimir Komarov, who later would become the first to fly to space twiceand tragically the first to die during a space mission. Voskhod 1, which established an altitude record of 209 miles (336 km), wasalso notable for being the first space flight to not include spacesuitsfor its crew, an idea that history records was first put forth byFeoktistov. Credited as only second to Chief Designer Sergei Korolev inthe development of the world'sfirst manned spacecraft, Feoktistov initially opposed the idea ofadapting Vostok for a three-person crew, calling the idea unsafe. Hisstated objections were all but abandoned however, after Korolev suggestedthat Feoktistov might fill that third seat. "Well, that was a very seductive offer," Feoktistov said in a1991 interview with the U.S. television series NOVA. "A few dayslater we produced some rough sketches [and] our first ideas wereaccepted." The decision to omit spacesuits for the crew and remove the ejection seatsused during the one-man Vostok flights was driven by logistics: threesuited cosmonauts would simply not fit within the spacecraft. Fortunately, Voskhod 1 proceeded without incident as had there been an in-flightemergency, there were no means of escape for the crew. Feoktistov and Yegorov, the first civilians in space whose trainingwas shorter than prior cosmonauts, were initially disoriented bythe microgravity environment but recovered before the end of the16-orbit mission. All three men becamea bit disoriented after landing by the political landscape waiting forthem on the ground. Despite having talked with Nikita Khrushchevduring their third turn about the Earth, by the time they had toucheddown, the Soviet Premier had been removed from power, replaced bya trio of leaders. Feoktistov would later recount the highlights of his flight toauthors Colin Burgess and Francis French for their book, "Into ThatSilent Sea: Trailblazers of the Space Era, 1961 - 1965,"published in 2007. He listed "the rising and setting of the sun; theobservation of layers of brightness above the horizon before the shipwould leave the shadow of the Earth; and the fast moving, recognizable butvery unusual colorful map of the Earth's surface." After his flight, Feoktistov continued his previous work as a spacecraftdesigner, contributing to the development of the Soyuz spacecraft, workingon the technology needed to accomplish rendezvous and docking, aswell as setting its dimensions. He campaigned to fly on the second Soyuz mission, after the first suffereda parachute failure taking the life of his Voskhod 1commander Vladimir Komarov, but his efforts were rebutted by NikolaiKamanin, the head of cosmonaut training, who declared Feoktistov didn'tmeet the physical standards for a pilot. Feoktistov then turned his attention to the growing debate withinthe Soviet Union's space program to pursue a moon landing or developa space station. "In the 1960s, it was clear to us engineers that the mostimportant development for manned flights would be the creation of orbitalspace stations," he told NOVA, "but the administrationwas against it." "We didn't know how to get the bosses to change their minds,"he continued, "but some well-wishers in the Party Central Committee cunninglyinserted a passage into [the General Secretary Leonid] Brezhnev'sspeech saying that orbital stations promised the right way forward." Feoktistov went to work on the design of the Salyut space station, aimingto fly aboard one himself. Initially refused again, he worked as aflight controller until finally in 1980, he was assigned to theSoyuz T-3 mission and the 13th expedition crew for the Salyut 6 station. He would come within just a few days of launching when he was grounded due tomedical problems. "The Voskhod venture opened a door to outer space," he told aRussian TV journalist in 2001," and I hoped to walk through that dooronce again on a serious and longer space mission." "Life has, however, rewritten my plans," said Feoktistov. Continuereading about the life of Konstantin Feoktistov at collectSPACE.com.